While 3D printers are printing smaller and smaller objects, in finer and finer details, things are moving at the other end of the scale as well. We’ve seen concepts of monstrous printers that can 3D print entire homes, but they’re still far out in the future. 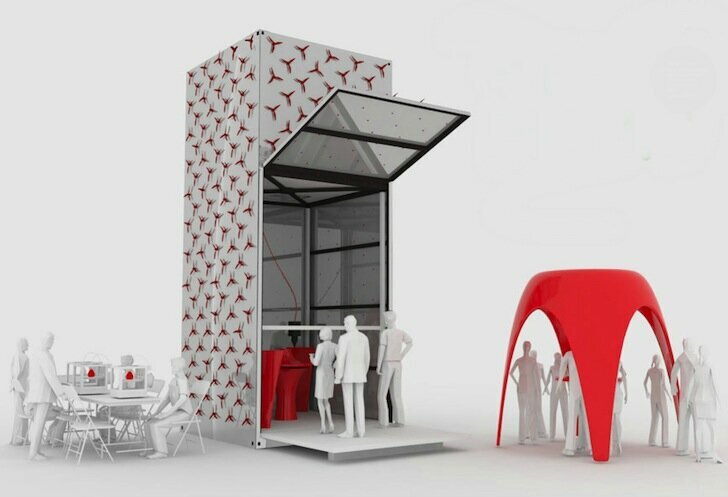 However, we are seeing real printers getting larger, and Dutch architecture firm DUS has produced a prototype of a printer that is big enough to print furniture-sized models and even small structures that can actually offer shelter for people. I kid you not. This prototype is called the KamerMaker, and is based upon DUS’s normal-sized 3D printer, the popular Ultimaker. The difference: the KamerMaker can print objects up to 2.2m X 2.2m X 3.5m! And while you wouldn’t think this, the unit is mobile–well, as mobile as anything this large can be. The goal of the KamerMaker is to, pardon the pun, do big things. They see this as a traveling pavilion, where on-demand architecture can respond to local needs. Think of such a printer creating rooms or home modules on-site, to provide permanent or temporary housing, perhaps even using recycled plastic. Watch their video to get an idea of where they see this all going.